Brock Osweiler has a fantastic combination of size, arm strength and accuracy. He has great tools, he just needs more starting experience so he can continue to develop. Overview: Brock Osweiler stepped into the void left at QB thanks to Steven Threet’s concussion issues last year and he flashed intriguing potential throwing for 797 yards, 5 touchdowns and no interceptions on 109 passing attempts last season. He started hot this season as well and currently has thrown for 1,352 yards on 117/172 passing (68% completion with 7.9 yards per attempt), 10 touchdowns and 6 interceptions. He also has 66 rushing yards and 2 touchdowns on the ground. He has really demonstrated a lot of potential this year as he has helped upset both Missouri and USC, two pretty established programs. Like the developing Arizona State team Osweiler still has to learn how to finish games and finish teams off, but they have flashed the upside to win their division and compete for the Pac-12 title, especially since they have already beaten their main competition in USC. Osweiler has a lot to do with that emergence. Size: Osweiler has fantastic size for a quarterback. He is listed at 6’8”, 240 pounds and his size is reminiscent of Ryan Mallett’s size from a year ago. 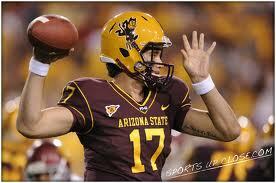 Arm Strength: Osweiler’s height isn’t the only thing that is reminiscent of Mallett as a prospect. 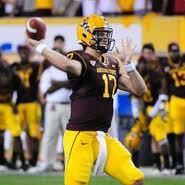 Osweiler might have the strongest arm in the nation now that Mallett has graduated. He has an absolute rocket and he can make absolutely any throw with great zip. He generates a lot of power when he drives through the ball and it really allows him to make some impressive throws even when the timing of the pass isn’t exactly what you would like. He can also put the ball in some really tight spaces because of his pretty quick throwing motion and his strong arm because defensive backs don’t have much time to react to the ball once it is thrown due to the velocity of the throws. Accuracy: Osweiler’s accuracy was quite surprising to me because I didn’t anticipate him placing the ball as well as he has in all of the games I have watched of him. He was particularly impressive in this aspect against Missouri, but also flashed quality ball placement against Illinois contrary to what you might think looking at his stat line. He throws a good deep ball and does a good job of placing the ball on the correct shoulder of the receiver, but he also throws very accurately into holes in the zone in between multiple defenders and seems to be accurate to all fields as long as he can set and throw. Occasionally he will miss easy throws that he should make without much problem, such as throws into the flat on bubble or tunnel screens. I’m not sure if he is rushing the throw to give the receiver time to make a play before the defense reacts or what, but it happens once or twice a game. Mechanics: Osweiler’s mechanics are much better than I expected them to be. He has a clean throwing motion that is consistently quick and he drives the ball very well when he releases the ball. He has good footwork when taking snaps from shotgun, but he is almost exclusively a shotgun quarterback which means he will have to develop the ability to make three, five and seven step drops. He steps into the majority of his throws and even flashes the ability to step into a throw even when he knows a hit is coming, which is something that is critical for his progression into a quality NFL starter. He does not fade away from throws as often as I was afraid he might which is good to see. Osweiler has room to improve when making pre/post snap reads and I would like to see him improve his pocket poise. Mobility: Osweiler might be a huge quarterback but his mobility isn’t as bad as you might think. His short area quickness is not very impressive, but he does have the ability to make a defender miss in the pocket partially because of his athleticism to avoid him but also because he is just so big and tall that defenders can’t tackle him with a half-assed arm tackle. Thanks to his long strides he can really pick up yardage surprisingly quickly when he is running in a straight line, but he doesn’t change directions very quickly and definitely isn’t a guy you have to scheme against to take away his ability to scramble in that sense. However, he isn’t as much of a statue as you might think he would be at that height. Pre/Post Snap Reads: This is one place where I think Osweiler needs to improve, but at the same time he only has seven total games of starting experience to this point so he is still developing and learning as a starting quarterback. Regardless, he doesn’t always recognize when blitzes are coming so he doesn’t identify his hot reads, though he does demonstrate the willingness to make checks and audibles at the line of scrimmage which is great to see for a quarterback with such limited starting experience at this point. But he does need to improve his ability to make pre-snap reads at the line of scrimmage, especially since he spends so much time in the shotgun. His post-snap reads are also a bit of a mixed bag because he more than flashes the willingness to go through multiple progressions (which isn’t necessarily typical for a spread offense quarterback) but far too often for my liking he drops his eyes to try to avoid the rush instead of continuing to look downfield. It especially bothers me when he only makes one or maybe two reads and then he drops his eyes and leaves the pocket prematurely when there really isn’t significant pressure that would constitute scrambling outside the pocket. He needs to continue to work on his pre and post snap reads as well as his poise in the pocket. There is potential there, he just needs to continue to develop. Intangibles: I think Osweiler has pretty good intangibles. As I mentioned earlier I have seen him making checks at the line of scrimmage which is an encouraging sign of football IQ because of how limited his starting experience is. Plus, he has flashed the ability to make pre-snap reads as well as go through multiple progressions, and he tends to make good decisions and doesn’t force a lot of throws into coverage. He’s also fairly reliable late in games, he just hasn’t been on the top of his game late partially because of dropped passes that have killed late drives he has tried to lead. I think he has the ability to be a closer late, and hopefully over the next year and a half he will come into his own in that respect. Character: I don’t know much about Osweiler’s character or anything like that, but he seems to be a solid leader and his teammates seem to follow him fine. This is something that is nearly impossible to evaluate from an observational perspective since all I can do is watch his games, I can’t actually talk to him and his coaches like NFL scouts can. Overall: I am a pretty big Osweiler fan. I think he has a ton of upside thanks to his great combination of size, arm strength and accuracy. He’s still developing obviously which is why this is a preliminary scouting report, but I love his upside and I think if he is developed appropriately and coached up he can be a quality starting quarterback in the NFL. He’s got the upside, he just needs to finish the rest of this year and come back for his senior year to continue to get more starting experience before he goes to the NFL. It will be interesting to see how he progresses the rest of the season because he has a lot of upside, but as teams start to figure out some of his tendencies (like dropping his eyes in the face of pressure at times) he may start to struggle a bit. I look forward to seeing how he does the rest of the season because I really think that with him at the helm Arizona State has a chance to represent their division in the Pac-12 Championship Game. Projection: If Osweiler came out this season I think he would be a 3rd round pick because he has so much potential but he is raw and needs to develop for another two years before he would be ready to start. But if he stays for his senior year and comes out for the 2013 draft I think he has 1st round potential and if he continues to progress and develop I think that is where he will end up. Quietly he is 6-1 in his career as a starter against some pretty legitimate competition outside of UC Davis to open this season. He’s definitely one to watch, so if you get a chance to see one of his games you should take a look. You’ll marvel at his size, arm strength and accuracy. He’s got the tools, he just needs more experience. Thanks for reading, hopefully you enjoyed my Brock Osweiler scouting report!